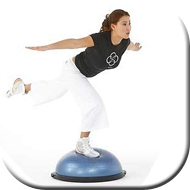 By changing the surface area, shape, hardness and perturbability of an item it can be used for a variety of exercises and stretches. Once you have mastered any object while standing on both feet with eyes open you can make the exercises more challenging and fun by standing on one leg, combing manual tasks like juggling a ball or even closing your eyes. Always try and use the tools to assess the limitations of your client and choosew exercises relative to their rehab or functional needs.